Our vessel (T-439) is an ex-Army T-Boat from 1953. T-Boats were built out of wood between 1940 to 1951. There were 110 steel T-boats built from 1951-1953 at Missouri Valley Steel located in Leavenworth, Kansas, National Steel, Shipbuilding Corp., in San Diego, California, and Higgins Co. in Louisiana. 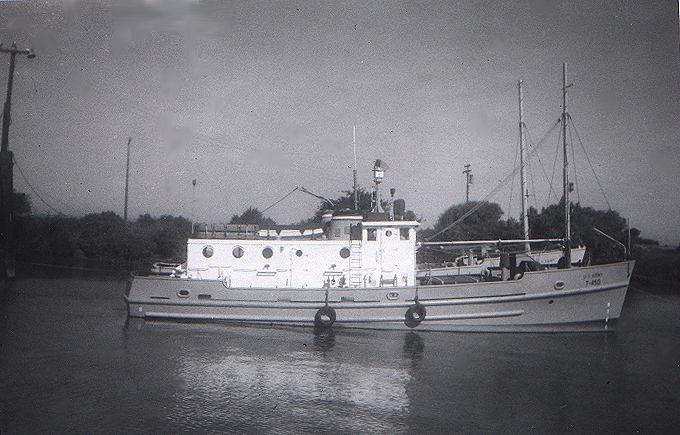 These vessels were to be used for personnel and supply transports, light-duty towing, and firefighting. The main engines varied with the different shipyards, but included Buda 1878 4 cylinder, V-8 Caterpillar D-375, and an inline six cylinder Caterpillar. T-boats also had Hercules fire pumps and DC electrical systems, which have had many different modifications. Many T-boats were put immediately into mothball once they were completed, since the Korean War ended while they were still under construction. Others saw military service, some went to Universities, and various other uses. The Ship with hull number T-439 never saw action in the Korean War. T-439 went to California Maritime Academy, where some parts were removed; after it’s time with the Academy, it was donated to the Sea Scouts, the Gryphon was in search of a ship, thus she’s ours now.